Pulse of Montana Recipe Contest is Open! In 2019, we’re celebrating the lentil things. 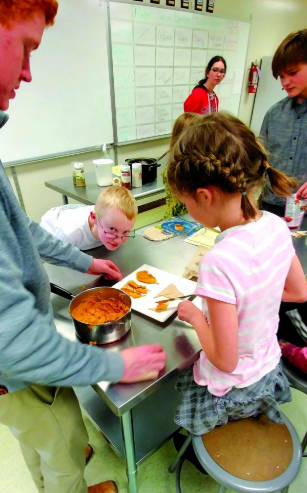 Take for instance the Ennis Elementary School students’ recipe for Pulse Pita Pizzas: cooked red lentils combined with olive oil, tomato paste, and spices to make for a deliciously balanced pizza that is better than the sum of its rather ordinary parts. This recipe, developed by culinary science teacher Jamie Diehl, was featured on The Madisonian last Thursday and we are more than excited to see this crop get much-deserved attention, especially in Montana! Montana is the top producer of lentils in the United States, producing almost 40% of total lentils grown in the country. It’s no wonder why folks are referring to these curious seeds as the “pulse” of Montana. This crop is given much spotlight on Montana’s Harvest of the Month program, claiming both January (lentil month) and May (chickpea month) to showcase more scrumptious recipes, from Lentil Barley Soup to Bistro Chickpea Salad Sandwich. We believe that the only thing better than a delicious and nutritious pulse recipe is one that utilizes crops grown by Montana’s own farmers. Some of Montana’s farmers are finding innovative ways of making agricultural practices healthier by virtue of the lentil’s classification as a pulse crop, allowing for fewer pesticides and fertilizers in their field. Are you a Montana Harvest of the Month registered-site looking for a way to celebrate our state’s beating heart? Take part in the “Pulse of Montana” recipe contest! This is an opportunity to test and submit pulse recipes for a chance to win one of six $100 prizes for your site. The Recipe Contest is open to individuals representing any site that is registered for and participating in the Montana Harvest of the Month program during the contest period. Sites that are currently eligible for the program include: early care and education programs, schools, afterschool programs, Summer Food Service Programs, healthcare facilities, and business/community pilot sites. New sites that register during the contest period are eligible to enter the Recipe Contest, which will take place between January 1, 2019 and May 31, 2019. The submission period will open at 12:01am MST on January 1, 2019 and will end at 11:59pm MST on May 31, 2019. So, don’t hold back! Begin exploring the infinite ways of preparing this versatile food today!